GDPR is the most heated topic and we’ve been receiving a lot of queries about how one can comply with GDPR while using Convert Plus. 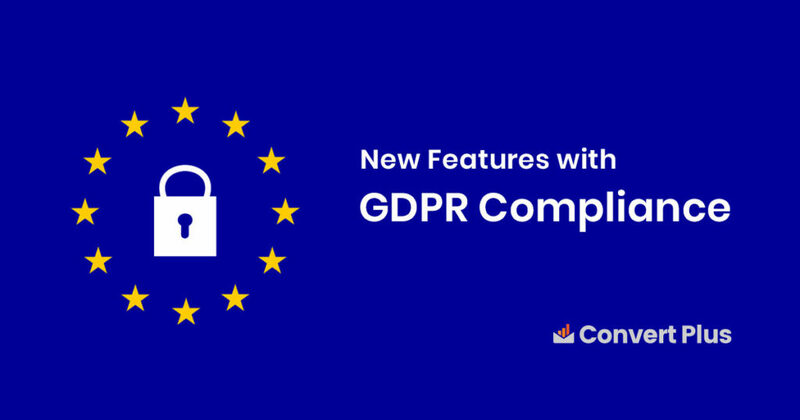 I am writing to you, to give you a gist of how you can comply with GDPR while using Convert Plus and to introduce some great new features that we’ve worked on in this update. Let us take a quick look at some new features we present to you in Convert Plus version 3.3.0. We all know that Convert Plus comes with an inbuilt lead capture tool called Connects. 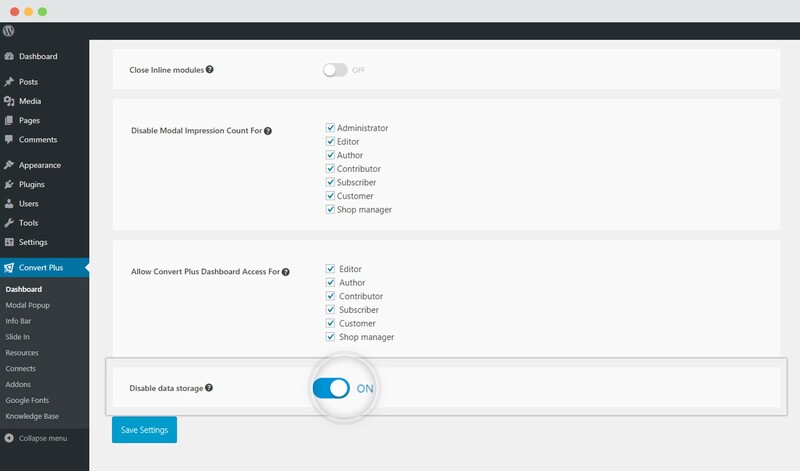 Connects lets you integrate Convert Plus with external email marketing service providers, mailers, etc and also saves data within respective campaigns in your WordPress backend. With the GDPR law coming in, a number of users asked whether they prevent storing information in the WordPress backend. We’ve worked on this! You can now disable data storage on your website. You can refer to the article about disabling data storage. Note: Disabling data storage will only send information to the respective mailer without saving it under the specific campaign in your WordPress backend. Convert Plus has inbuilt analytics that helps you track the impressions and conversions received on each module. It was not possible to track this data when you use custom forms like Contact Form 7, Gravity Forms, etc. within a Convert Plus module. In Convert Plus version 3.3.0, we’ve now made it possible to view the analytics of custom forms created using shortcodes from Contact Form 7, Gravity Forms and Ninja Forms in Convert Plus. You can now track the performance of these forms too! In the earlier versions of Convert Pro, it was possible to trigger a module with a CSS class. In this recent version, we’ve made it possible to trigger it with a Custom selector. This means that you can use class or ID attributes to trigger a module. You can refer to an article in our knowledge base that will help you trigger a module using a custom selector. Many times, users would want to write some custom code to modify the modules to design and make them work as per their needs. A few users found it difficult to search the specific class name for a module they wished to modify. To make this a lot easier, we’ve introduced the custom class option that will allow users to simply add a class name they wish to use. Bored with the same old overlay style? Convert Plus 3.3.0 allows you to add images in the background too. You can refer to the knowledge base article that explains how you can add a background image in the overlay. Apart from these, Convert Plus version 3.3.0 also allows you to add a background image to the overlay of your module and add alt text for all the images in a module. You can take a look at the changelog. Since the GDPR fever is on, we have an article that will help you stay GDPR compliant while using Convert Plus. Like always, we make sure that most of our user requirements are met. Therefore, we align all of them as per requests and prioritize them with a few other improvements and fixes. Just like these, the upcoming updates will fulfill some more requests too. Have suggestions and ideas for us to work on, please feel free to post them in the comments below or you can write to us for further technical help.